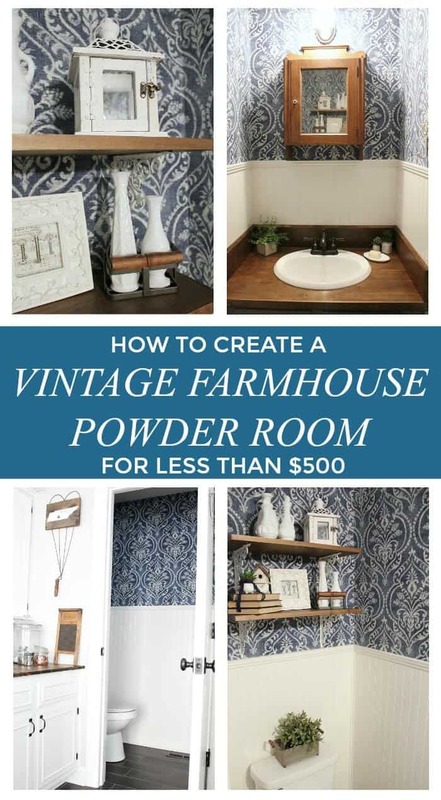 Vintage Farmhouse Powder Room – for less than $500! 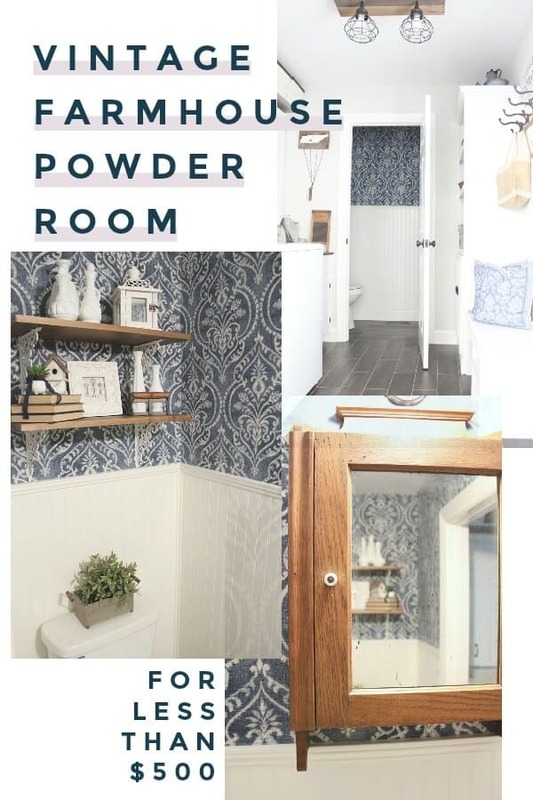 I can’t believe we are here – the final reveal of this Vintage Farmhouse Powder Room. It has been so much fun pulling this room together on a budget. Since we were making this room match the adjacent decor, this powder room finally adds a cohesive feel to my downstairs. Since we used materials we had on hand, we were able to keep out of pocket costs at a minimum. Of course, the reveal wouldn’t be as stunning if I don’t start with the before. 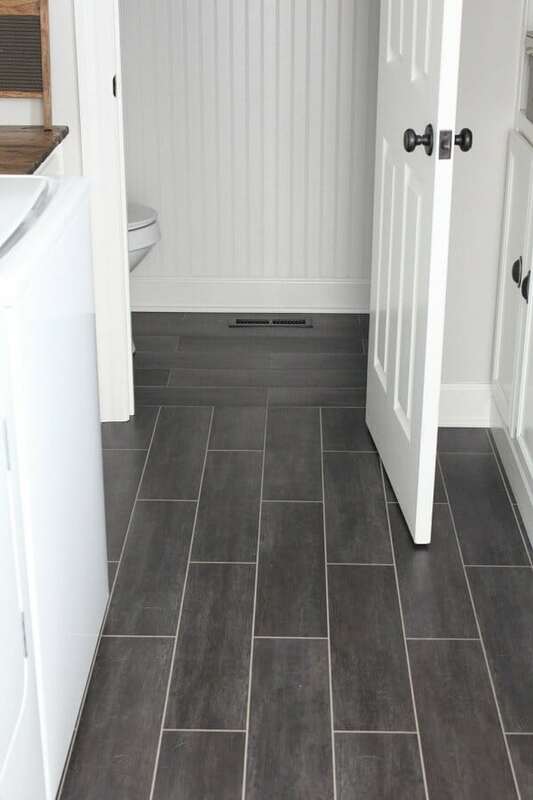 In Week 1, we extended the flooring from our Laundry Room into the half bath to match as well as install the beadboard wall. Week 2, we painted the beadboard and sink cabinet base. 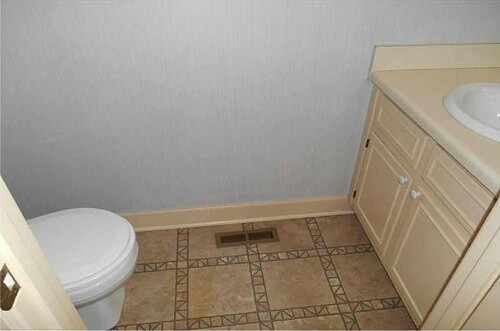 We also installed the new toilet. We hung the temporary Fabric wallpaper in the Third Week, and I’m in love with how it looks! The fourth week was the slowest with progress and we found and painted the brackets for the shelves over the toilet. 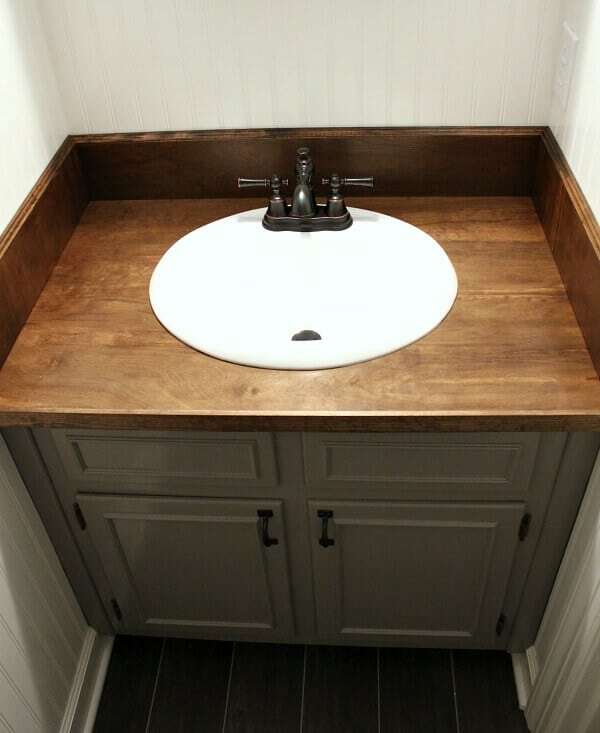 In Week Six, we installed the Wood Countertop for our sink. This was where we ran into our first hiccup. Our faucet that we purchased did not fit our sink we planned to reuse, so we had change out the original faucet to one that would accommodate the sink. It set our budget back a few bucks, but the headache was an easy fix. So now comes the fun stuff – adding the decor! I styled the shelves with a mix of new purchases and items from my personal collection. I found this tiny wooden birdhouse at a local shop here in town. It is so cute – it even lights up! 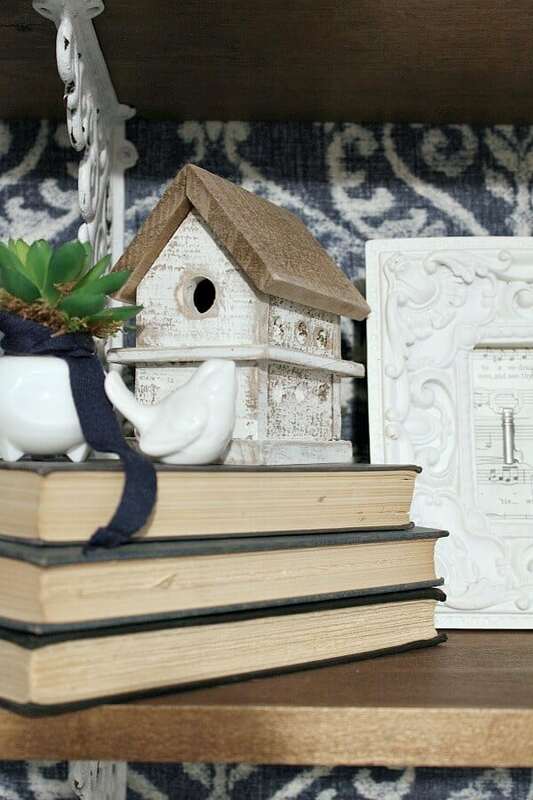 I styled it with some books I had on hand as well as a tiny ceramic bird. The vintage milkglass piece is from my succulent garden I made last year. My collection of milkglass decanters works perfectly in this shelf styling! I have had this frame in my collection for years, but never had a place for it until now! Another purchase I made was this cute white lantern. It was on sale at Hobby Lobby for 50% off! Over the sink, I was finally able to install the vintage medicine cabinet given to us from Trent’s parents. I cleaned it up using a mixture of olive oil and vinegar to revive the finish. It’s complete with the original ceramic pull. 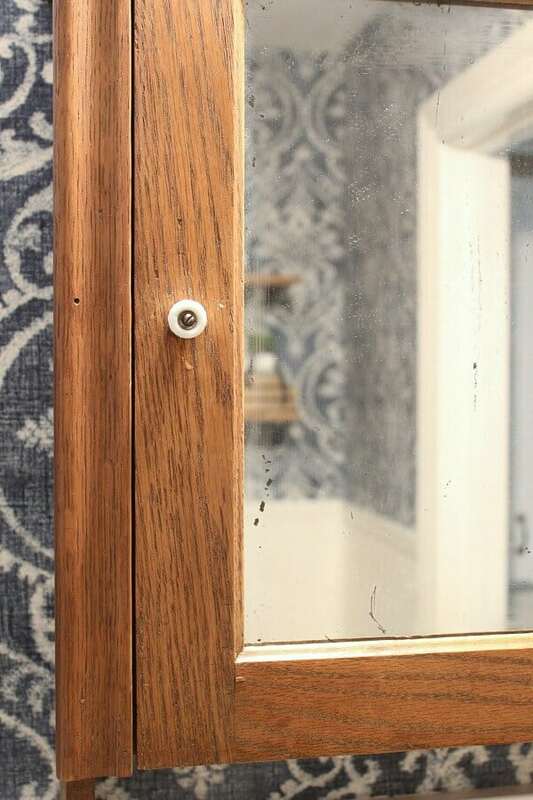 Of course, the mirror is perfectly aged and weathered! 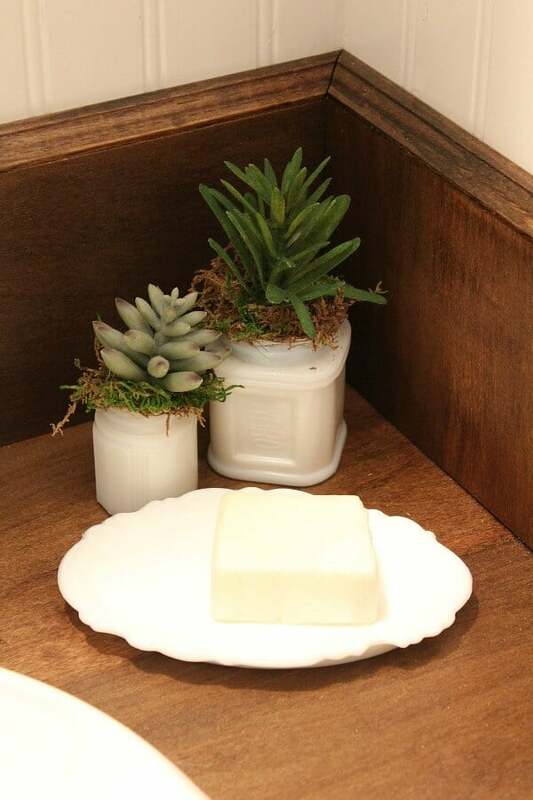 I added a few more mini milkglass succulent plants with a vintage milkglass soap dish I found years ago. 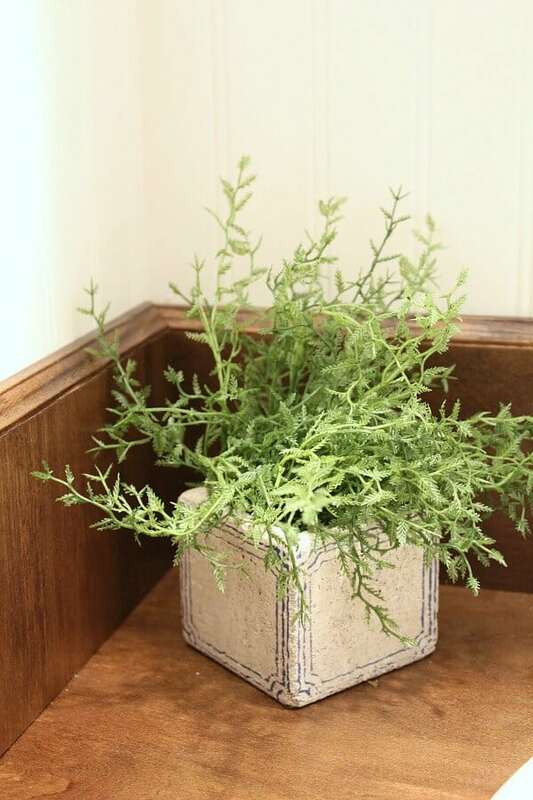 Since I found this cute cement tile planter for only $5, it was a huge score! This cast iron hook came in a set of three and works great as a towel hook. Now for the numbers and sources. Affiliate links are provided at no cost to you, but may treat me to a cup of coffee! Read my full disclosure here. I can’t believe we are under budget! 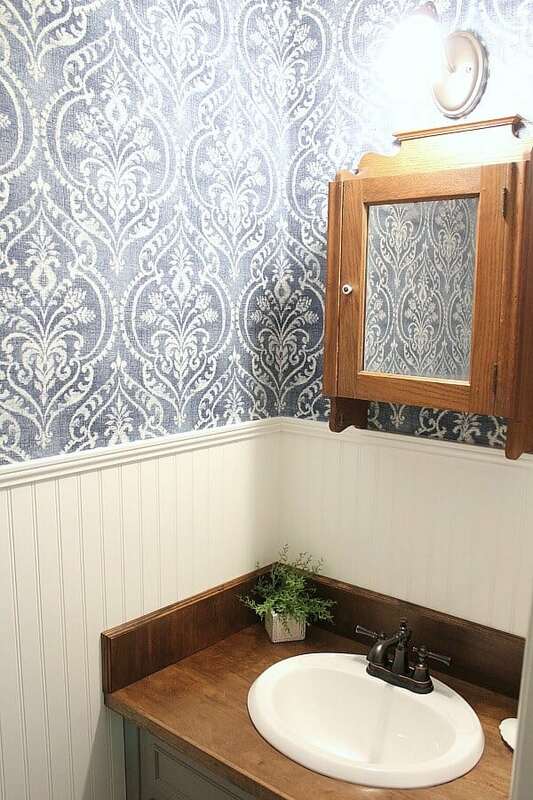 The goal for this Vintage Farmhouse Powder Room was to use materials we had on hand and to make our out of pocket purchases minimal. I am so pleased with the results! And I think I’m going to treat the boys to a nice dinner with the left over money for putting up with our room remodel. I will be spending the next few days celebrating all the other bloggers and their big reveals over at Calling it Home’s link up. So much inspiration for sure! A huge thank you to Linda and House Beautiful for hosting such an incredible challenge! It’s always so fun to join in. Wow that is a lot of impact for the budget! I am amazed! 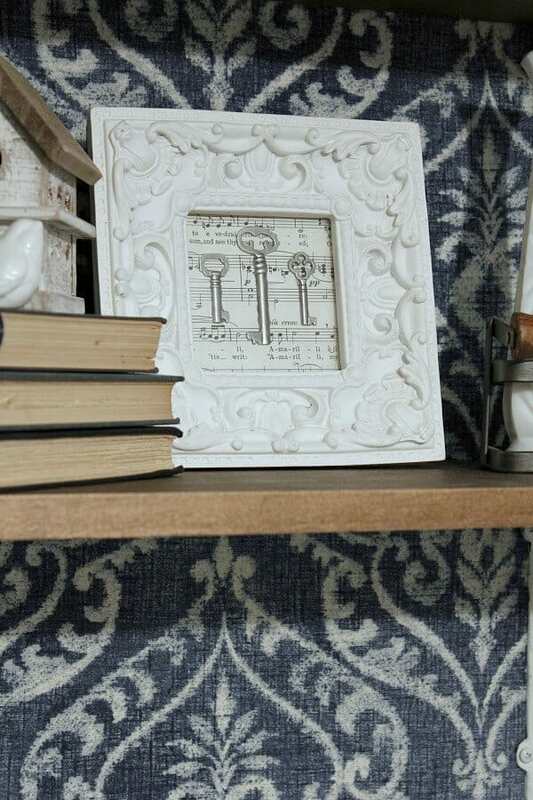 The fabric wallpaper is a great idea. 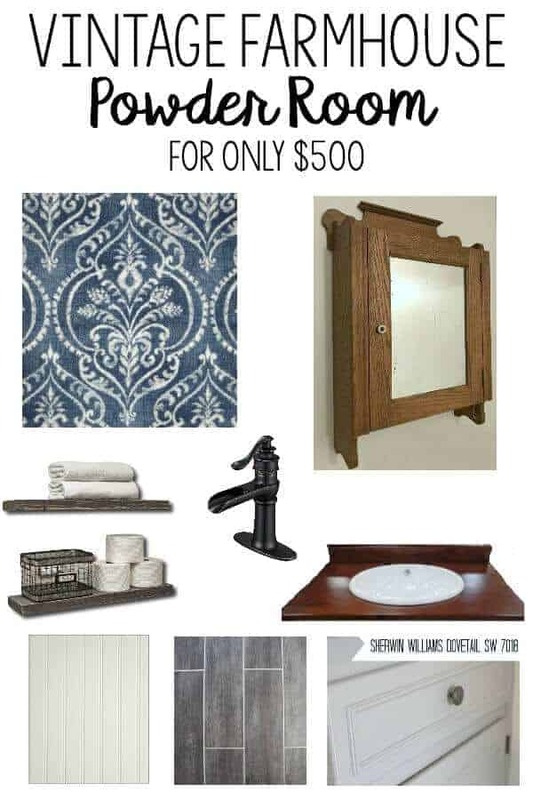 We have a bathroom that needs a refresh and this is inspiring me to see what I can accomplish on a budget! Great job Jen! I love-love your new bathroom space! What a beautiful transformation! Absolutely FABULOUS job and impressive that you did all of this under budget. It looks great. Way to go! 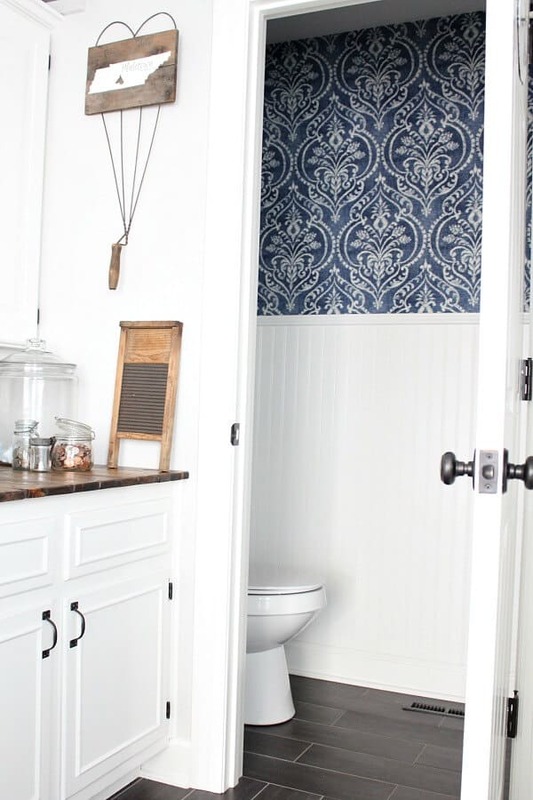 I love your powder room — the details and styling are totally on point. 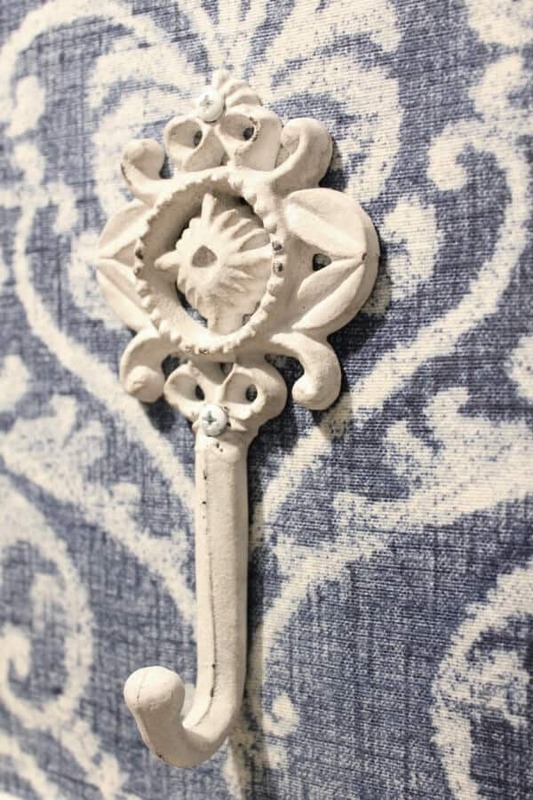 Being able to use materials you already on hand is such a smart way to remodel. 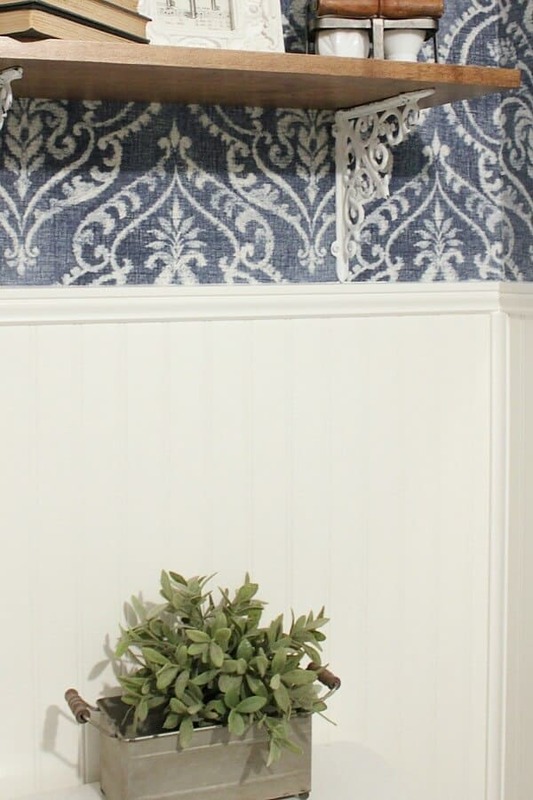 The fabric “wallpaper” is my favorite touch! Thanks Laura! We are so pleased with how it turned out! Thanks Momma! Can’t wait for you to see it in person! Thanks Tammy! 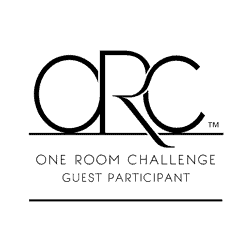 It was so fun doing the ORC with you! Deb – I’m honored that my little room inspired you! Thanks so much for taking the time to leave such sweet words. It was fun doing this ORC with you! Wow! Love reveal, fits in perfectly. Love how it loooks from outside the powder room! 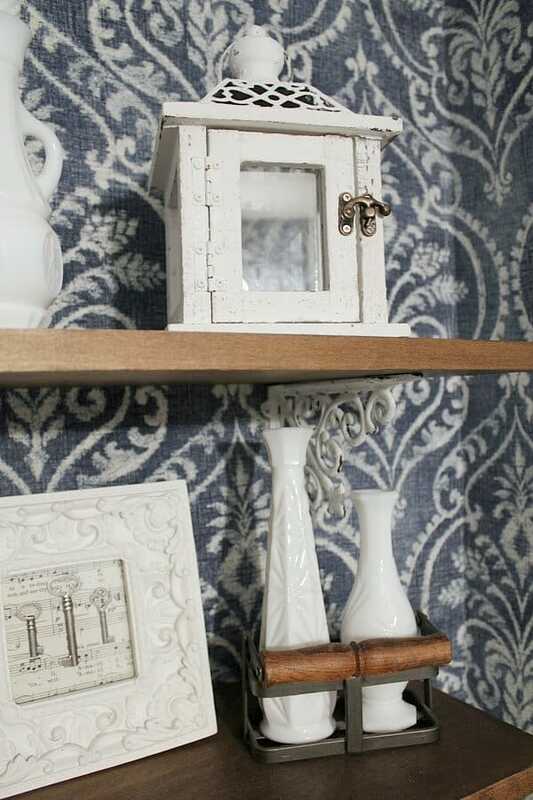 Everything works so well together.. so many great milk glass accents. Great job! Thank you so much, and yeah…. I kinda have a milkglass addiction. Like a moth to the flame each time I find a piece! Thanks for taking the time to leave such a sweet comment! Such a great transformation!! It doesn’t even look like a budget makeover. 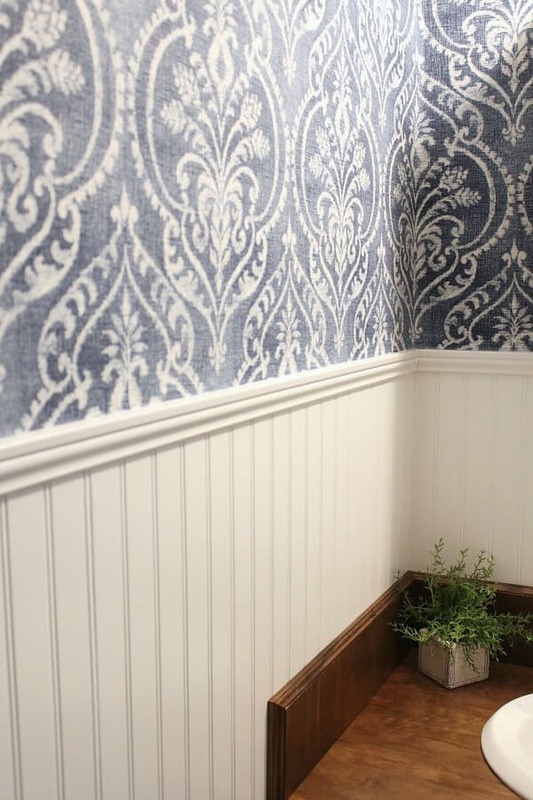 The wall paper is so gorgeous, and all the little details bring the space together. I LOVE that light fixture!! Where is it from? Great Job!! What a beautiful transformation and a bargain at the same time. LOVE!!!!! Michaela – you are so kind!! The light fixture is original to the house just updated a few years ago with some spray paint. Thanks for taking the time to leave such kind words! Jen, what an absolutely charming space. You have flawless taste. I love it so much!! Simply Beautiful room Jen! 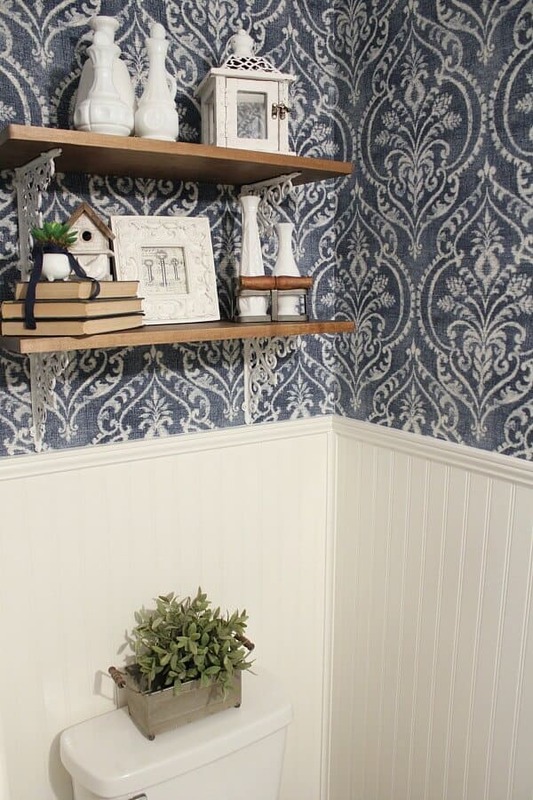 Love the wall paper and the shelf styling the most! Congrats and Cheers to us for another room done! I love everything about this room. The floors, the headboard, and that gorgeous fabric wall treatment. And of course, the mom glass accents. Well done! 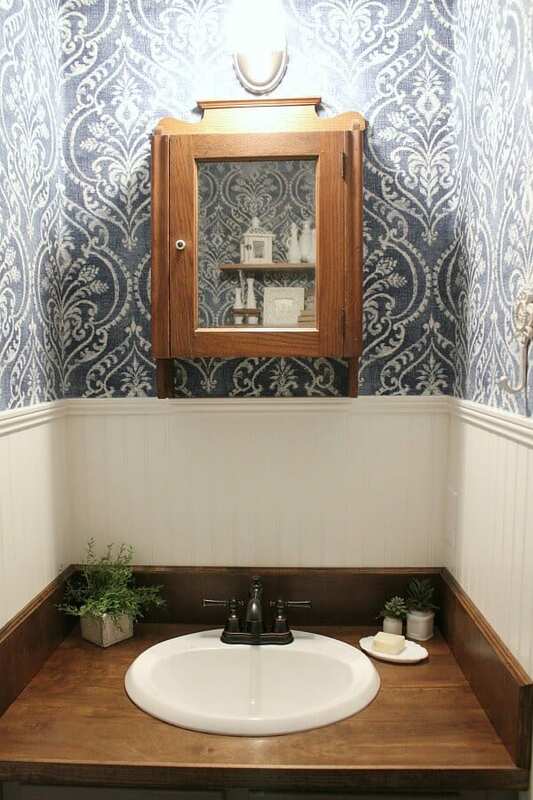 Jennifer, your powder room looks amazing! I am in love with all the wood tones. The medicine cabinet is such a treasure. 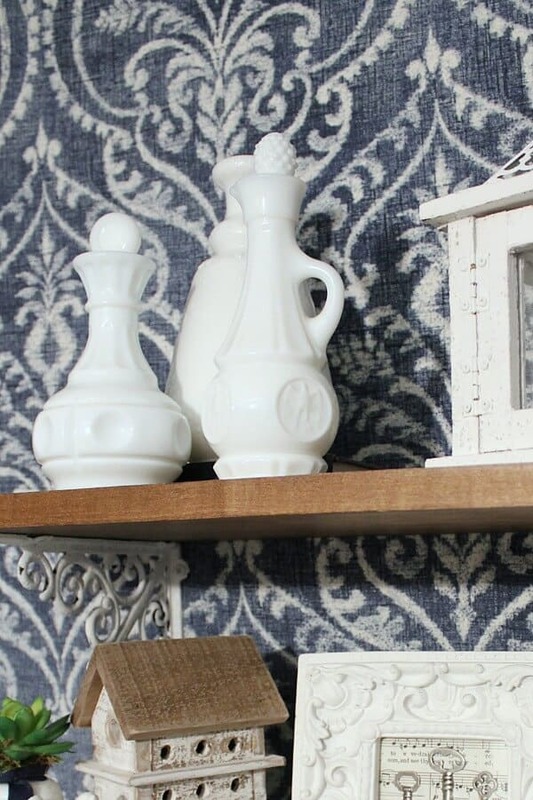 Your fabric choice for the wall treatment is perfect. It really brings the space together. Congratulations on a beautiful makeover!!! Brandi – you are the sweetest! Thank you sweet friend! 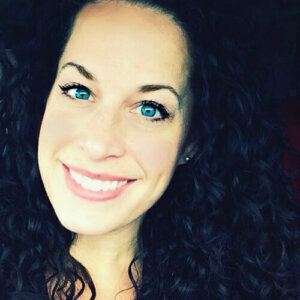 Susie – your sweet words make me smile! Thank you for taking the time to leave such nice comments! Thank you Angie! You are so sweet! Thanks Vel! We made it! Thanks Tee! You are such a sweet lady! Sweet Cristen! I can always count on you for the perfect compliment! Thank you friend! Jen, what a transformation! 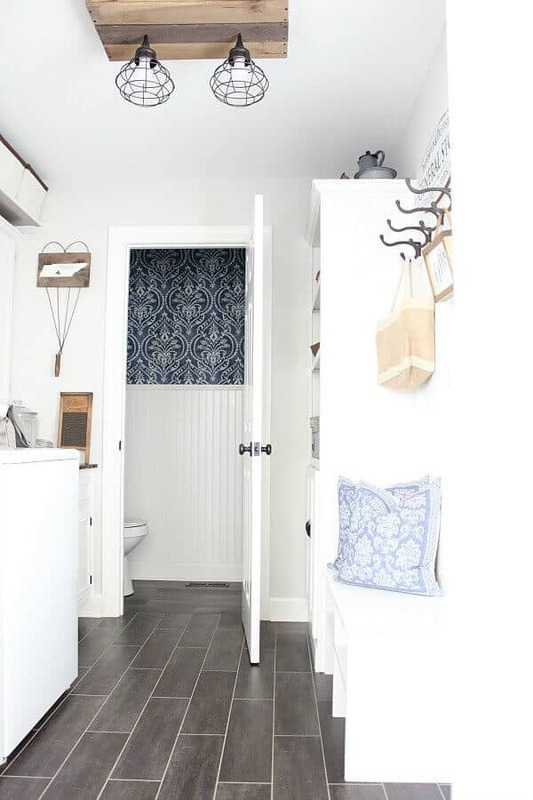 You made the most of your budget, and the bathroom is adorable. 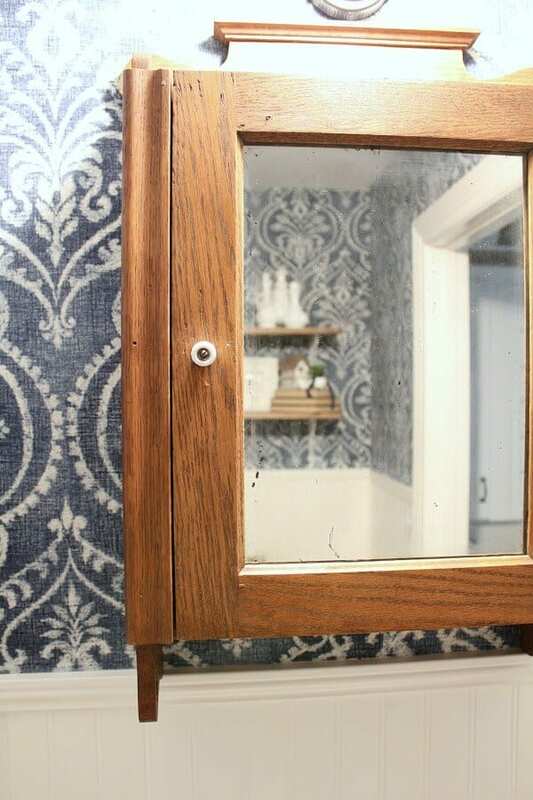 That vintage medicine cabinet caught my eye. It’s a beauty! I can’t believe you pulled this off with only $500! You did a beautiful job! And that wallpaper is a show stopper! Thank you so much Stacy! I hope to join in again this Spring – what about you? That fabric wallpaper is amazing!!! And I love the vintage family touches, they are the perfect compliment. Incredible job!! Thank you so much Tina! That means so much! What a beautiful, well-put-together space, just full of special touches. I love everything about it! 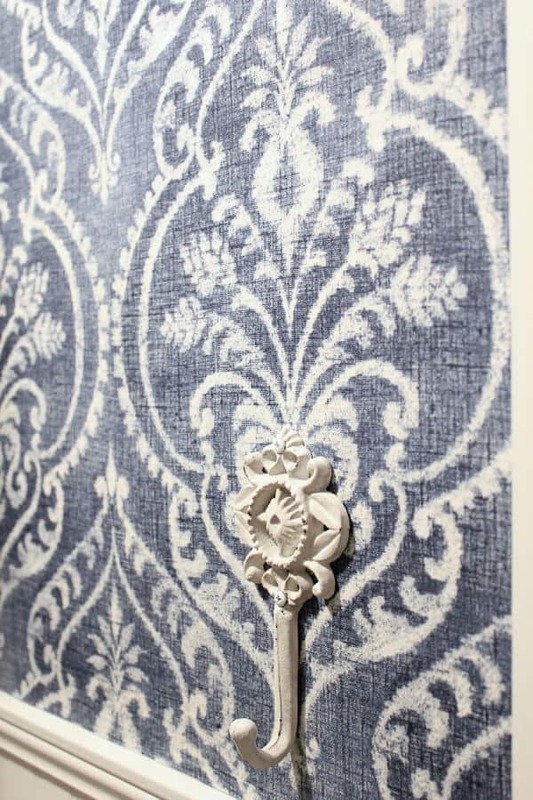 And yes, I’m going to echo everyone else- the fabric wallpaper is stunning! What a beautiful bathroom! That wallpaper is to die for, I am in love! I’m all about great design on a budget and you knocked this out of the park!! Congratulations! What a great space! I love the wallpaper you chose. Everything looks so good! you did an excellent job and I hope to see you in the spring. Thank you Tamara! You are so kind! Thank you Kalila! I am so glad you liked it and yes, we hope to join in the fun again this Spring!